Clifton Duncan, Alex Mandell, Ashley Bryant, Katie Sexton, Ned Noyes, Jonathan Fielding, Akron Watson & Amelia McClain in "The Play That Goes Wrong"
This sounds about right! The acclaimed Broadway comedy The Play That Goes Wrong, which recently announced an August 26 closing date, will now remain at the Lyceum Theatre through January 6, 2019. By its new closing date, The Play That Goes Wrong will have played 27 previews and 745 regular performances. 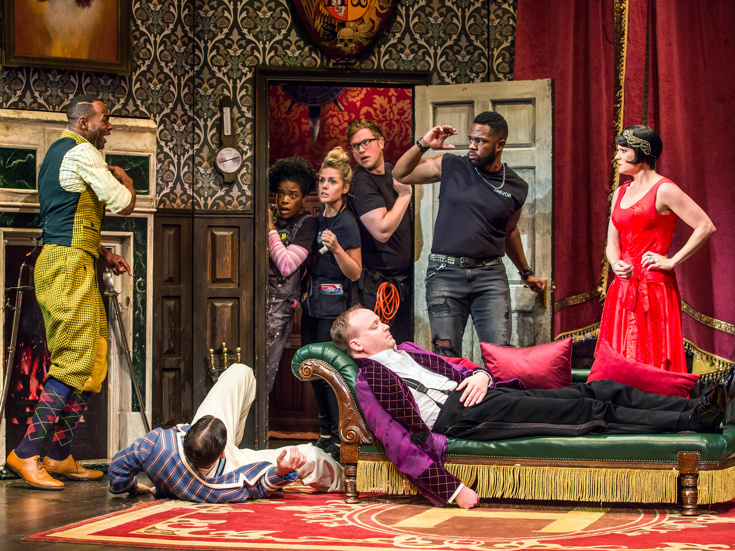 Created by Mischief Theatre members Henry Lewis, Jonathan Sayer and Henry Shields with direction by Mark Bell, The Play That Goes Wrong introduces audiences to the Cornley Polytechnic Drama Society, a performance troupe attempting to put on a 1920s murder mystery. As the title suggests, it doesn’t go so well, and the accident-prone thespians fight against all odds to make it through the performance to final bows. The current cast features Akron Watson as Trevor, Mark Evans as Chris, Ashley Bryant as Annie, Preston Truman Boyd as Robert, Alex Mandell as Max, Harrison Unger as Dennis, Jonathan Fielding as Jonathan and Amelia McClain as Sandra, along with Ned Noyes, Ashley Reyes, Katie Sexton and Quinn Van Antwerp. The Play That Goes Wrong took home the 2017 Tony Award for Nigel Hook's scenic design. The Play That Goes Wrong began Broadway previews on March 9, 2017 and opened on April 2, 2017. The production will make mischief across the country with the launch of a national tour opening in Pittsburgh this September. Additional tour cities, dates and casting will be announced at a later date. London's Olivier Award-winning comedy arrives on Broadway.